Rough start to the day. I checked the starter and it did not look very bubbly (as it had in days before). The weather had turned cold again. Our house is quite chilly this week. I think the starter decided to go dormant. 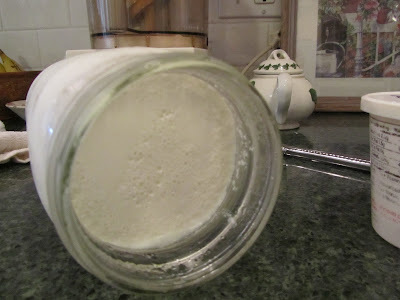 I gave it its AM feeding of 1/3 cup flour, 1/3 cup warm water. I popped it into the oven, with just the light on. After 1 1/2 hours, small bubbles are returning. I'll keep it in the oven, with light on, for the next 2 days. To the left is the starter in the AM, after small bubbles had begun to reappear. I kept the starter warm in the oven, with the light on, or on the counter just above the oven (while baking). By the end of the day, the starter had begun to develop larger bubbles. I may need to foster this starter outside of the fridge for an extra day or two. We'll see when the weekend comes. It should be foamy and bubbly at the point of refrigeration. I'll keep it in the oven overnight. 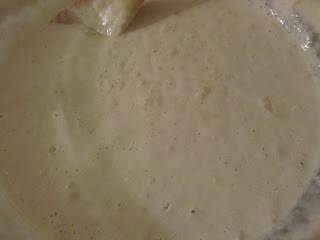 To the left, is the starter 3 hours after PM feeding, 1/3 cup (40 g) flour, 1/3 cup (80 mL) warm water. I waited overnight, to get one more picture for you. 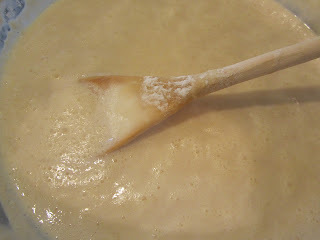 When I first checked on it, it looked flat again, but feeding and stirring really helped. This is actually the morning of Day 7, two hours after the AM feeding. I just gave it flour this time, as the starter was looking too thin. I may have mis-measured at some point, and added too much water. 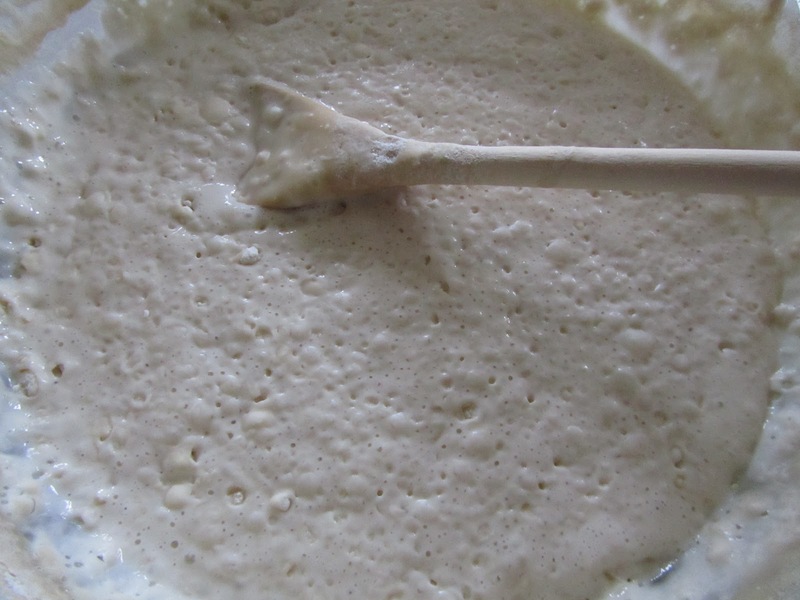 In any case, the starter should be about as thick/thin as pancake batter, after you stir it up. Here you see it looks bubbly, and kind of like beige cottage cheese. The aroma is very faintly beer-like. I've been keeping it in the oven with the light on, and that warmth has really helped it. When the beer smell is stronger it will be ready to use then refrigerate the rest. Almost there! I'm hoping to use some tomorrow to bake a loaf of bread.